For Charleston, South Carolina, Designer Missi Ervin and homeowner Sam Cato, renovating a former horse stable and carriage house in Aiken meant returning the historic cottage to its equestrian roots. The soft gray color of the house's weathered cedar shingles inspired the interior's neutral palette. A leather tufted ottoman and mohair on the sofas "wear like iron"—a plus considering Sam has five dogs, including Patch, the Jack Russell terrier shown here. A rustic farm table takes the place of a central island in the kitchen, giving Sam a spot for casual meals. "I was tired of the look of white or stainless steel," says Sam about her choice of a gray farm sink. An antique Welsh cupboard holds a taxidermy hen and rooster, china, art, and a collection of woven baskets. The horse stalls are off the kitchen, making a daily ride part of life here. The European oak floors look old but are actually new from Bois Chamois (boischamois.com). The company distresses flooring to resemble reclaimed wood. Ninety yards of Gastón y Daniela's equestrian toile was paper-backed to hang as a wallcovering. 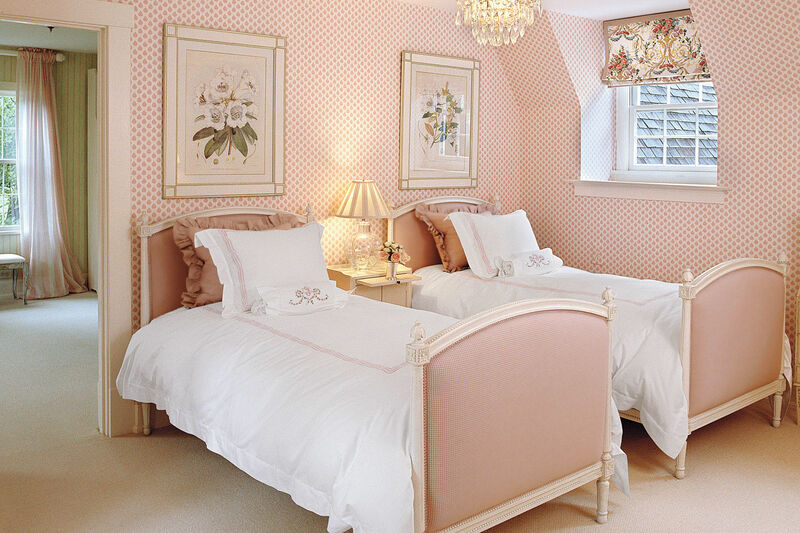 The floors are painted Linen White by Benjamin Moore. Found feathers fill Sam's late husband's silver sailing trophy. A robin's egg blue in the linen curtains inspired the wall color, Silver Ash by Martin-Senour Paints. Sam and Brumby walk the road past her shingle-style home. Aiken has preserved its signature dirt roads for horse-friendly traffic. Dog collectibles, including a doorknocker and tiny statues, are displayed throughout the house.